I have lots of new articles and things to blog about. I’ve written a list and going through it and continually adding to it whenever something sparks my interest. I’ve been featuring lots of artists and songs recently so hopefully something art related will be in store in the next couple of days. I do have a sneak preview of a company I’ve been tweeting and emailing with regards to writing an article for them and my interview with them will feature a bow tie of their company. I’m looking forward to writing a nice one, detailing their brand with LOTS of photos and really showing the little brands that are the ones to watch. 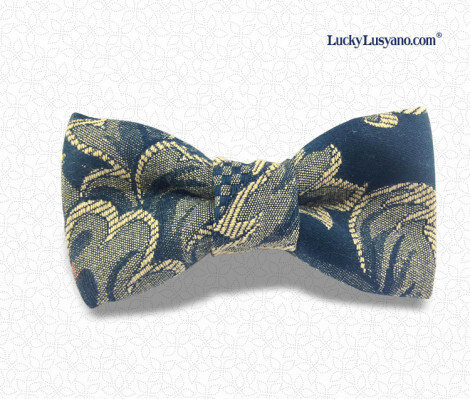 The brand is called LuckyLusyano and offers exclusive handmade Italian made bow ties. The designs are smashingly dapper and really unique. The patterns and colours chosen are specifically wonderful features! Cannot wait to review their brand. Here is a sneak snap of one of their designs! Hoping tomorrow at work doesn’t leave me too exhausted. My one big problem are the long hours and sheer tiredness I feel after work. It takes a lot out of you on your feet for 10 hours+ serving coffee without breaks. All I want to do is write articles and learn some new fashion skills! London for me is the start of the rest of my life. Hi Tom – just been reading your blog after having visited the Fashion Museum in Bath and now having coffee in Colonna and Small (supposedly the No1 coffee shop in the country. I am hopefully going to visit London Wednesday to go to a museum with an exhibition on men’s suit tailoring. Perfect for my blog and the people I write for! How was bath, the coffee shop sounds quaint!